The above info came from Elwin Blaine Coldiron and atomofish, and was edited by yours truly (contact me). The image came from Amazon.com. Notice: This is not Japanese animation! I have, however, decided to include it on this site anyway. If you're one of those hard-core anime purists who can't stand seeing a non-anime series on a site dedicated to Japanese animation, then just press the Back button on your web browser and pretend like you were never here. Over a thousand years ago, a clan of gargoyles had guarded a castle and its inhabitants on the Scottish coast. However, because of a great misunderstanding during an attack from Vikings, that group was placed in a deep sleep... until the castle they guarded and was their home rose above the clouds... in the 20th Century! However, the ambitious industrialist David Xanatos found out about the legend, bought the castle, and reconstructed it as his skyscraper home. Now these gargoyles are freed from their stony slumber... only to find they were now in 20th Century New York City. They now have to adjust to this new age, as well as finding new enemies... and new allies along the way. NOTE: Many of the voice actors in some of the episodes of the series were also actors in the various "Star Trek" series of the late 1980's to mid 1990's. 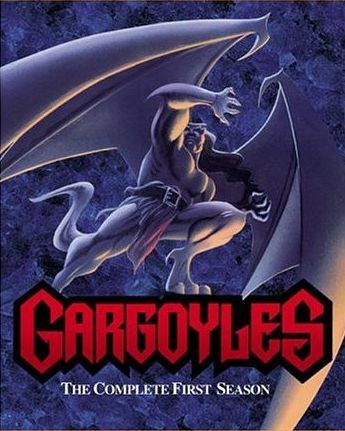 Gargoyles is an epic story that begins in Scotland in the year 994 A.D. Gargoyles are creatures that are immobilized in stone by day, but when night arrives, they awaken from their stone slumber in order to help defend their home. However, they are betrayed leaving only six surviving Gargoyles. A curse was placed on each of them, forever imprisoning them in stone "Until the castle rises above the clouds." Flash forward 1000 years later. An wealthy and eccentric businessman named David Xanatos buys the castle where the Gargoyles sleep, placing them on top of a Skyscraper "above the clouds" in New York City. The curse is finally lifted and the six are reunited once again. However, they are shocked to find themselves 1000 years into the future, and have a hard time adjusting to the more modern 20th Century lifestyle. Their mistrust of humans deepens even further after they are tricked by Xanatos, though later they are betrayed by one of their own as well. But they also befriend a Policewoman named Elisa Masa. With her help they adjust to this new time and find a new home where they can be safe from their enemies. Now under the oath to protect their home of New York City, they become "protectors of the night" battling any evil that crosses their path. However, they discover that they are not alone. The Past and Future will intertwine and they'll soon learn that the World of the Gargoyles is much bigger than they have ever imagined.